Alex and I went to visit friends in Boston this past weekend. Our original flight back to St. Louis was cancelled due to the hurricane, so we enjoyed the chance to stay a little longer with our friends Randy and Sarah. (Thank you again for putting us up!) What better way to enjoy an extra day of vacation and an impromptu day off of work than by doing a little baking? We’d made a trip to an apple orchard earlier in the weekend, so we had tons of delicious apples at our disposal. 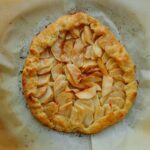 Sarah had never made a pie crust before, so I recommended we try an Apple Galette, which is really just a free-form apple pie. 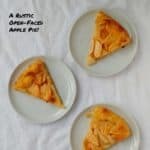 I found this recipe for an Apple Galette via the Today Show website, but it really comes from The Joy of Cooking. This was amazing. The galette turned out much better than I expected. The all-butter pastry dough was flaky and just slightly crisp at the edges and gave way pleasantly when bit. The apples kept their shape well. It was light and had a great presentation. I thought it might be too sweet, but it wasn’t. It may have been flakier if we’d let it bake for additional time, but the pastry was nicely tender the way we made it. I think I may prefer it the way we made it. We had no leftovers. Like this recipe or have questions? Rate it or leave a comment below! 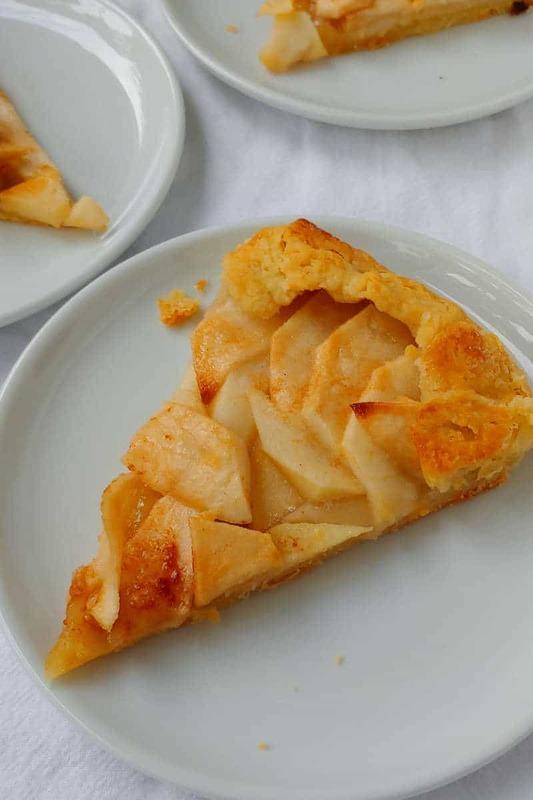 Apple Galette is an open-faced, free-form apple pie - no need for a pie pan! Sift together flour and salt. Cut in part of the margarine with a pastry cutter or 2 knives until butter disappears into flour and looks like crumbs. Cut in rest of butter until you have pea-sized pieces. Stir in 3 tablespoons water gently with a fork until a dough forms. Add up to 1 teaspoon more cold water if there's still dry crumbs. Do not overmix. Use your hands to form a ball of dough. Flatten it into a disc and and wrap in plastic wrap. Refrigerate for 30 minutes to let the dough hydrate and become easier to roll out. Remove the dough from the fridge. Unwrap plastic wrap and cover dough with another piece of plastic wrap. Roll out dough between the two layers of plastic wrap into an 11- or 12-inch round. Carefully transfer to a baking sheet. Brush dough lightly with melted butter and sprinkle with the tablespoon of sugar. Core, peel and slice apples to 1/8-inch thickness. (We peeled, then halved, then cored, then sliced the apples; you don't have to turn them into rings.) 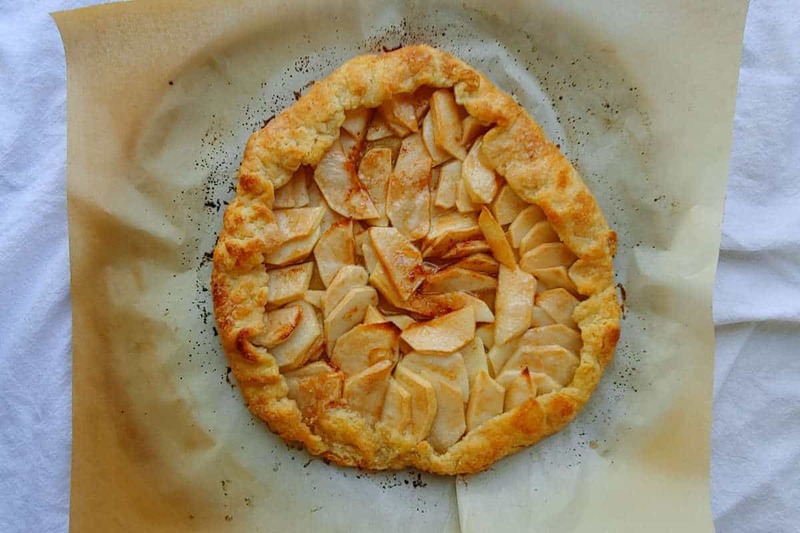 Arrange apple slices in circles on the dough, leaving a 1-inch border around the edge. (We had about a quarter of an apple leftover.) Fold the dough border over the apples. Brush with all but 2 teaspoons of the remaining butter. Combine the cinnamon and sugar and sprinkle over the pastry. We baked it at 425F for 20 minutes, until the pastry just began to brown. Then we dialed back the heat to 350F and baked it for another 11 or 16 minutes (I can't remember which!). The recipe in the book said to bake it for 5-10 minutes, while the recipe online says 20-30. Our apples began to brown, and we decided we didn't want them to burn. After removing the galette from the oven, we brushed it with the remaining butter and let it cool before serving.